For its size, New Haven, population 1,727, hosts a lot of energy infrastructure: A large electric substation sits off Route 17. Solar projects are popping up in farm fields faster than dandelions in June. The path of a proposed gas pipeline runs right through town. So residents were wary when they got word over the summer that developers want to run a new $650 million transmission line from Beekmantown, N.Y., under Lake Champlain and into what would amount to a five-story building in New Haven. Essential to the project would be a new converter station to connect the proposed line to the existing transmission system. At 57 feet, it could be the largest building in town. Would it be an eyesore? Would it be noisy? Those questions arose during a civil discussion last Tuesday at the town hall, where about 100 New Haven residents sat for more than two hours on hard metal chairs, quizzing developers over the details. Eugene Cousino, who lives within view of the proposed converter station, had already made up his mind. "Ain't no way," he said, while looking over project diagrams before the meeting started. "Buy me out or whatever. I ain't going to live next to that." 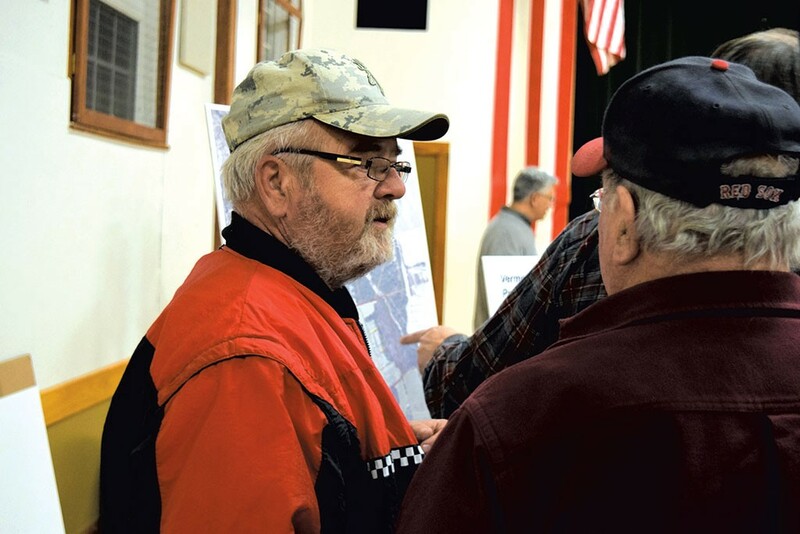 Others in town are more inclined to support the project — if it's not too loud and the town and neighbors are fairly compensated. "I lean toward the 'yes' side of it," selectboard member Steve Dupoise told the crowd, though he added, "There's lots of questions that need to be answered before I vote 'yes.'" Residents of New Haven, a rural Addison County farming community that straddles Route 7, have plenty of experience vetting energy projects. They've become savvy, if sometimes weary, negotiators. In 2006, the Vermont Electric Power Company, or VELCO, the state's electric transmission company, upgraded an existing New Haven substation, which gave the town an industrial-looking tangle of wires, towers and metal that now offers an inviting connection to the electric grid for the proposed project. In 2012, Vermont Gas proposed what has become a contentious project to build a 41-mile pipeline extension from Colchester to Middlebury. Ten miles of the underground line, which is under construction even as state regulators weigh whether to reconsider its approval, would pass through New Haven. In the last couple of years, New Haven's relatively flat farmland has attracted so many new midsize solar projects that town officials were overwhelmed by all of the applications and ensuing squabbles among neighbors about siting. They traveled to Montpelier earlier this year to beg legislators to give towns more say in such projects. "The No. 1 lesson is to be proactive about it," Dupoise said about the power dynamics. "If you're not in the driver's seat, at least be in the passenger seat and not in the backseat." This latest project may be the grandest and most lucrative of them all, from New Haven's point of view. "It's a pretty big project. That's putting it mildly," said Carole Hall, a selectboard member, who, along with Dupoise, will represent the board in negotiating with the two companies developing the project. Anbaric Transmission, a Massachusetts-based electric transmission developer, and National Grid, an international energy company with utility operations in the Northeast, are proposing to build a 60-mile, 400-megawatt transmission line that would start near Plattsburgh, N.Y., and run under Lake Champlain to New Haven. It would carry power from yet-to-be-built wind turbines in northern New York, with backup from Canadian hydro sources, said Alex MacLean, president of strategic communications at KSE Partners, a Montpelier lobbying firm that is working with Anbaric and National Grid. The power would not be used in Vermont but continue on to southern New England, where densely populated markets are looking for new sources of "clean" power. Vermont — and New Haven — just happen to be along the way. The latest under-the-lake power transmission project, called the Vermont Green Line, is one of several pending proposals to send power from Canada and northern New York south. "Vermont is between supply and demand," said Kerrick Johnson, a VELCO vice president who follows the regional electric supply closely. "There is an unmet need that is extremely significant." Massachusetts, Connecticut and Rhode Island are under the gun to find new clean sources of energy to meet state carbon goals at the same time nuclear and coal-fired power plants are closing, Johnson said. Several big-time investment firms have jumped at the opportunity, he said, and several transmission proposals are competing with each other. 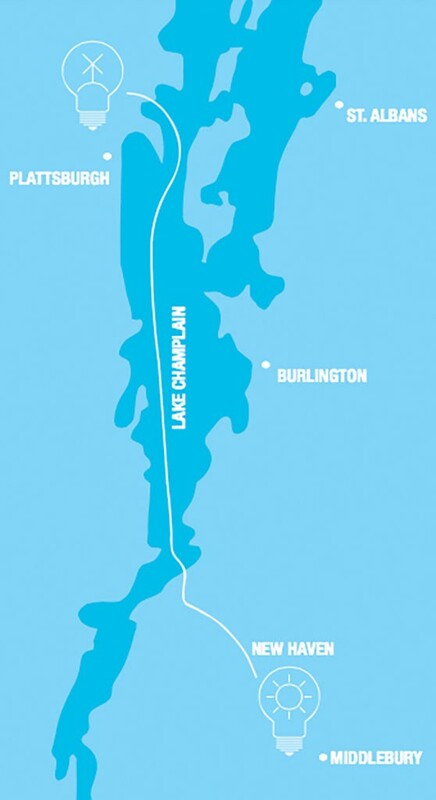 Two others would also extend power lines under Lake Champlain. TDI New England's is a $1.2 billion, 1,000-megawatt power delivery system called the New England Clean Power Link Project. It would run from Alburgh to Ludlow, passing under Lake Champlain for 98 miles. TDI, a developer backed by the investment firm Blackstone, has secured agreements with three Vermont towns and state agencies. The project would bring $138 million to Vermont ratepayers through VELCO and would provide $720 million to energy and environmental projects in the state over 40 years, including money for Lake Champlain cleanup and expansion of renewable energy. The project is awaiting approval from the Public Service Board. The same company is planning another project, the Champlain Hudson Power Express, which would run down the New York side of Lake Champlain from Québec to New York City. Another initiative, which New England-based Eversource calls the Northern Pass, proposes to send 1,090 megawatts of Hydro-Québec power overland from Canada, through New Hampshire. More such projects are planned in Maine. New Haven would be the endpoint for the Vermont Green Line — two concrete-encased, six-inch power lines that would run 40 miles along the floor of Lake Champlain to Kingsland Bay State Park, then 14 miles underground through Ferrisburgh to New Haven, where the converter station would prepare the power for the nearby VELCO substation. From there, the electricity would be sent onto the New England power grid. Recognizing the complexity of the project, New Haven hired Richard Saudek, a Montpelier lawyer and former chair of the Vermont Public Service Board. The selectboard is also hoping to engage sound, outdoor lighting and aesthetics experts. The town aims to do its homework before signing any agreements, according to Hall and Dupoise. Part of that will be figuring out how to pay for the research. "If you throw enough money around, it turns heads," Dupoise said. The developers have won the support of Alan Mayer, the New Haven fire chief, who told the crowd at last week's hearing, "I don't see that it would be a very negative impact on the town." Joe Rossignoli, director of U.S. business development with National Grid, told the audience that the developers have been listening to local residents. Based on fears about the project's eventual size, they've dropped plans to make the project expandable from 400 to 800 megawatts. "This is a significant concession," Rossignoli told residents. The developers have also agreed that sound from the converter station will not exceed 40 decibels outside neighboring homes, comparable to a quiet office. "These guidelines are adopted voluntarily," Rossignoli said. Dupoise and Hall said that before the town agrees, they want to be able to compare the proposed decibel limit to the current sound level at the site. Saudek said he wants to know not just how loud the converter station will be, but also what kind of sound it will produce. Residents at last week's hearing also wanted assurance that if the sound ends up exceeding limits, something will be done about it. Rossignoli pledged that developers are willing to work with the town, offering the ultimate concession: "We're not interested in building this project unless New Haven supports it." Anbaric and National Grid have yet to apply to the Public Service Board for a state certificate of public good but likely will in March, Rossignoli said. 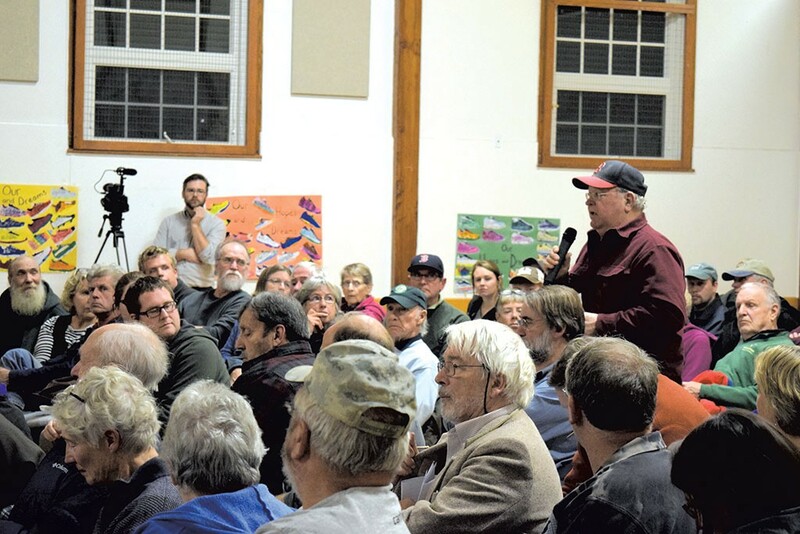 Because Vermonters won't gain directly from the line's power, the project developers probably will have to offer some statewide benefits, as TDI did. "We've discussed that with them," said Chris Recchia, commissioner of the Vermont Public Service Department, which is charged with representing ratepayers. New Haven officials are thinking the same principle should apply to their town. Saudek has represented Vermont towns in negotiations with wind developers and with the TDI project. "I tend to divert people from just focusing on the money," he said. "It's very important that the town feel comfortable with the deal. They have to have somebody they can call and get action from. It's important to understand that this is a long-term relationship." Correction, December 16, 2015: This story was updated to explain how the $1 million in proposed payments to the town would would be designated.